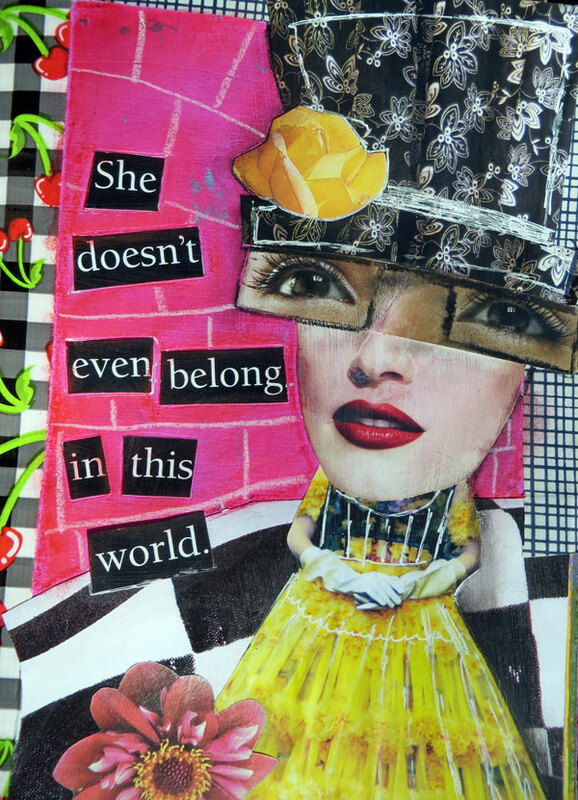 Can I show you some of the worst art journal pages I ever created? Because I think when we see all this beautiful gorgeous stuff on Pinterest and in magazines and whatnot…it’s so easy to feel intimidated. Hopefully these terrible art journal pages will help you feel a little bit better about being a beginner! And that self critic monster pops in and says “You’re not an artist!” and “You’re not good enough to be doing this” and whatever other nonsense our critical self might say… So, please, allow me to share with you my “Art Journal Failures” – pages I just don’t like. Now, some people will agree on me that these pages are horrendous, some of you may think I’m being too hard on myself…either way – I didn’t like how these pages turned out. Not really. I think I could have done better. But then, I also accept that I’m not perfect, my pages aren’t perfect, and spilling out some ugly color combinations or things that don’t make any sense can happen on occasion. So how do you deal with an art journal fail? It’s all relative I suppose. Where you see fail I think, “I wish my stuff looked that good”. I’ve always considered myself unartistic and recently my 7 year old has inspired me to explore that side of myself more. Thanks for sharing your “fails”. I tear out mine and cut up for use in other projects. That is a great idea Susan! Oh no! I could see something like that happening to me! i am new to this and i just discovered your site. i think it’s wonderful! you have just made it possible for me to get going. thank you so much. Well, I think your failures are only failures in your own eyes. Maybe they don’t look like someone else’s pages that you greatly admire…but, thank goodness everyone’s artwork is not all the same. My problem, I can never think of anything to say! It just becomes a book of pretty pages because I love the techniques. Have you tried checking out quotes sites online? Or maybe using great song lyrics that you love & that speak (sing?) to you? I find it hard work if I end up making something creepy or unpleasant! Overanalysis I guess 🙂 need to do it more tho, it’s good for the soul, but it’s very hard to leave my art critic out of the process! thank you thank you thank you. I sat here in tears (literally) this morning looking at what I was considering pages of art journal fail. I kept reminding myself that I cannot compare my beginning to others middles and ends. That combined with the frustration of not finding a black pen that would write well on top of acrylic paint made me really cranky. Or perhaps its the feet of snow that remain outside contributing to my crankiness. appreciate your post and the comments. I love the third one!! 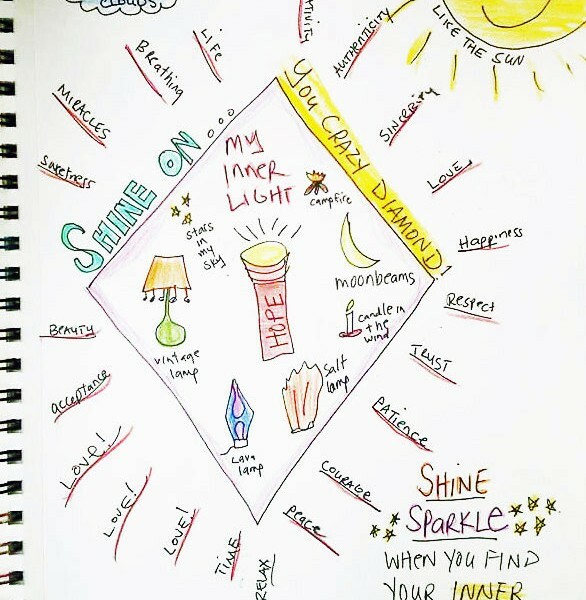 Just found journaling art on the net when I was bored out of my mind. I have painted for many years but not a professional. This is just great, marvelous, I love it and had never heard of it before. Just today I created two of the ugliest pages I have ever seen. Truly gross. So, for a while I just Adding Layers. And Then Eventually I Stopped. I Will Revisit Them Later. Ladies try the Junk Journal Junkies on facebook. The ladies there are wonderful and have lots of great ideals. Although I have no ideal why they call them junk journals. LOL some are so beautiful. I have been making them also out of boxes of whatever I can get my hands on. Complete covers with a spine. Check them out. I appreciate your showing us the examples of your “failures.” Beauty really is in the eye of the beholder isn’t it? NOT fail. There are no art journal fails… just perceptions of failure, which is not a FAIL, only one idea of what is acceptable. Accept and move on. Another day, another page…more art… it is all exemplifying where you are at a particular time… so, no FAILURE, just NOW and move to the next NOW!! I have been repinning tons of art journal entries, buying supplies, and scribbling about my life in odd places, hesitating to put it all together. Watched a video of someone layering everything in quick unplanned ways and I was inspired. Made three spreads today and they look pretty good for a beginner. Dive in journalists! This cheers me up a little, was feeling depressed today and decided to do a page in my art journal, but that made me even more depressed as whatever I did it didn’t look great. Also all these perfect pages you find on Pinterest etc. are depressing sometimes and now I realize I’m not the only one, I feel a little more possitive and inspired. Actually to my personal taste and opinion number 3 and 4 from top to bottom look really good. Especially number 4. Failure is the reason that I switched to using binders and loose-leaf for my sketchbooks. Well, really it was interrupted progress and I’d rather transfer used pages to a different binder and add new pages rather than picking up a half-finished sketchbook that had sat for a long time or leaving a half-finished sketchbook. My main sketchbook is a 5.5 x 8.5 address binder, and I can easily find old dayplanners to store old sketches in. I don’t see anything “wrong” with any of your pages. I like them, my favorite is the big one with the pink swirl in the upper left corner.